Keitaro Harada, conductor, is increasingly recognized at the highest levels for his artistic abilities. A student of Lorin Maazel at Castleton Festival and Fabio Luisi at Pacific Music Festival, recipient of the Seiji Ozawa Conducting Fellowship at Tanglewood Music Festival, Bruno Walter National Conductor Preview, and The Solti Foundation U.S. Career Assistance Award. Harada’s credentials are exemplary and, at the age of 29, his achievements are those of a seasoned conductor. In 2013, Harada was selected by the League of American Orchestras as one of only six conductors for the Bruno Walter National Conductor Preview, a prestigious showcase that occurs biennially in an effort to promote gifted, emerging conductors to orchestra industry leaders. In 2012, Harada was a semifinalist at the 9th Grzegorz Fitelberg International Competition for Conductors in Poland and also participated in the National Music Festival in Maryland. He made his conducting debut with Portland Symphony and led the Tucson Symphony’s new series at the Fox Theatre that continues throughout 2014. In 2011, Harada was one of ten semifinalists invited by Riccardo Muti and the Chicago Symphony to participate in the First Chicago Symphony Orchestra Solti International Conducting Competition. Harada has been the Principal Guest Conductor for Sierra Vista Symphony Orchestra since 2009. 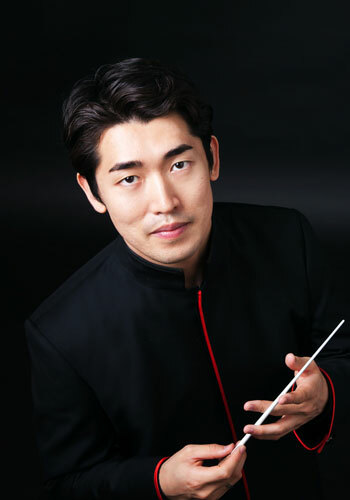 He is a threetime winner of the International Conductors Workshop and Competition in Georgia, received an Honorable Mention in the International Academy of Advanced Conducting in St. Petersburg, Russia, and was a semifinalist for the 2009 Eduardo Mata International Conducting Competition in Mexico City, Mexico. He has studied under Robert Spano, Michael Tilson Thomas, Oliver Knussen, Herbert Blomstedt, and Stefan Asbury. With a personal passion for training the future generation of orchestral musicians, Harada serves as Music Director of the Phoenix Youth Symphony. During his fourseason tenure, he has courageously expanded the Phoenix Youth Symphony’s season, planned his first European tour with the ensemble for 2014, and added challenging repertoire including: Stravinsky’s Rite of Spring; Also sprach Zarathustra; Short Ride in a Fast Machine; and Shostakovich Symphony No. 5. A native of Tokyo, Japan, Harada graduated from Interlochen Arts Academy. He completed his formal training at University of Arizona with Thomas Cockrell and Charles Bontrager. Very early in his career, he was selected as a guest artist for National Public Radio’s From the Top and is featured as a favorite guest alumnus on their PBS television documentary. Arizona Public Broadcasting produced a documentary on the bright career of Keitaro titled: “Music…Language Without Words” for the television series AZ Illustrated in 2013. Harada is represented by JEJ Artists.